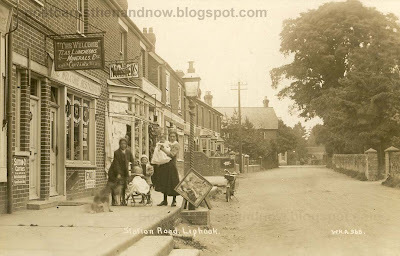 Liphook, Station Road, c1912. It is good to see that the Welcome Restaurant is still a cafe. You can see a sign for 1d Monsters. Penny Monsters were a pint of fizzy soft drink for a penny. They are mentioned in 'Coming Up For Air' by George Orwell. The sign on the ground is also advertising Monsters. Postcard by W. H. Applebee. Oh dear, that thing on the left looks like something we would build here in the U.S.